We are proud to present the 3rd in an occasional run of interview features - Sam Scott's recent interview with independent UK distributor Arrow Films. With the help of some questions posed by Rewind visitors and team members, here is the interview. We would very much like to and have attempted to license many Italian films but we had to turn them down as the material they were offering was not acceptable. 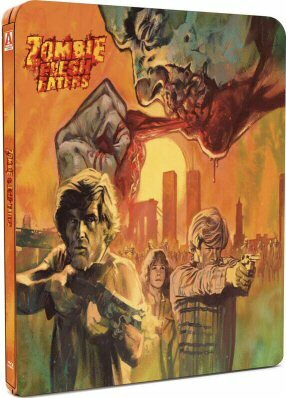 We have a very big commitment to quality across the board, in the past we were tied into some Italian films with issues and our customers let us know how dissatisfied they were so when we acquired ZOMBIE FLESH EATERS it was with the understanding that we would restore it from scratch ourselves. That was a huge success and we’re not turning back now - if we license any more Italian films it’ll be on the understanding that it’s a high quality master or we do it ourselves, but understandably companies rarely want others to restore films that already have an HD Master available so it’s certainly a struggle and this will be in the minority sadly. Is Arrow committed to releasing the entire Corman-Poe cycle? Suresh S.
We are releasing THE PIT AND THE PENDULUM next and hopefully more will follow. It’s a variety of problems because different licensors/producers operate in different ways. As explained above there are basic problems, in the past as was much more normal practice, you would acquire films and see what turned up in terms of a master and there was often little or no wiggle room. But the market has dramatically changed since then, as the market has shrunk there is a much greater emphasis on technical perfection so now we only acquire films when we know what material is available. Many licensors still find this odd and some even refuse to provide samples so it’s an ongoing struggle. On the independent side of things if a master has been created, often for DVD, ten or fifteen years ago, that person may say we released this in X Country and it’s selling well with the intimation we should believe them and buy it, but it’s very much all about Blu-ray now and we have potentially one of the best technical teams in the world so we’re not going to be duped by some crazy up-ressed master or old DVD master, and frustratingly this still happens for new HD Masters! Where masters have been made that we have acquired or looked to acquire and have had to refuse the problem is very basic - just not good enough, where it’s overly processed with digital manipulations or from a weak element, like a 35mm exhibition print rather than pre-print material like an Internegative or Interpositive, or in the best scenario possible the original camera negative and where possible for our own restorations we always always stay as close to the negative as possible (as we have done for ZOMBIE FLESH EATERS, TIME BANDITS, THE FURY and forthcoming releases such as WHITE OF THE EYE, the Borowczyk short films, WITHNAIL AND I and so on). It’s very much based on a combination of our own tastes and the feedback we receive from our fans, sales and emails/social media. Our team has very eclectic taste so we’re fortunate that combined we probably make a wide variety of people happy but we never compromise our label ethos, either for Arrow Video or Arrow Academy. Everything is very subjective so what we deem cult for Arrow Video may not be quite what people think should be on the label, if someone has a real disliking for erotica or samurai films for instance, but things are fairly cut and dry from our perspective. The thing is, cult is a very broad term but we tend to stay within a fairly generic interpretation by focusing on solid genre films with horror as a strong focus - this would probably be from the 1960s onwards though we’ll certainly consider earlier, like Mario Bava’s I VAMPIRI (1956, an extra on BLACK SUNDAY). For Academy it’s anything we think fits the mould of classic so that’s probably as much of a judgement call. We will be releasing Don Siegel’s THE KILLERS in March, a strong genre film but one we thought had a very good fit with the existing crime films on the Academy label (such as RIFIFI and some more upcoming crime films this year). We released a number of films, exclusively from Italy with problematic issues. We were tied into this deal and similarly for some other films, the ongoing customer dissatisfaction with those releases prompted us to practice differently regarding our material (see above). We then were also fortunate to acquire the services of James White, a restoration supremo which chimed in with our desire to do an Italian film ourselves to show the Italian licensors what can be achieved with correct procedures and attention to detail. That restoration was such a success it prompted us to do more which led to the films mentioned above and much more to follow. This also came at a time when we expanded our team and were able to handle more releases. There was also the issue of packaging which we had changed and then finally developed into what it is now, and will remain. Lastly, we were also very fortunate to pick up some incredible licenses, such as BIG TROUBLE IN LITTLE CHINA, INVASION OF THE BODY SNATCHERS, TEXAS CHAINSAW 2 and so on. All these changes combined was quite an overall change in a short period of time. Internally there hasn’t been much change in the approach to each title, our 2010 and 2011 discs of SPIRITS OF THE DEAD and OBSESSION are certainly on a par with what we are doing now, both quality restorations with solid extras and expansive booklets. Scream Factory have some great releases and we would certainly like to, but a lot (possibly all?) of their titles have existing licenses in the UK or we can’t seem to get them from the Studios clutches, in a certain pair of titles we were asking the Studio for them well before they announced them and we’re still trying now, but unfortunately they still won’t give them up! But we’ll keep trying for all the titles we know our fans want. It’s a bit of both but much more commonly we come up with our own wish list, that’s the case for MGM, Fox and Universal certainly, but even in some cases they don’t have the rights to the films themselves and our release of SQUIRM won’t be around long as the rights expire with MGM (and therefore us) much sooner than is usual. We currently have a kickstarter going that offers different rewards along the sort of scale you mention. We would definitely like to make our next kickstarter Arrow Video focused and have three possibilities pending but we need to get agreements from the rights-holders, access to the material and so on. Hopefully we will have something soon! It does, but a new encode (so not exactly the same) and we added another interview, with critic Maitland McDonagh and beefed up the booklet! The decision to make this a Zavvi exclusive was made before we decided to release it. Zavvi are always asking for certain titles to be a steelbook exclusive and we thought Zavvi might be interested in TENEBRAE so with their financial support of the release we were able to do it. Had we not had that support from Zavvi, this release would not have happened, it would be too risky to re-invest in a new release (from the deal structure with licensors this can often be tricky) and also releasing a title on Blu-ray for the second time too presented a risk but with Zavvi it’s been very plain sailing. It will be available from other retailers in the near future. Yes, the restorations mentioned above are all new following the existence of available HD Masters and the restoration of many of Borowczyk’s films have never been on any video format at all! And here are some bonus questions! First off, what are the criteria a film and its presentation source material should fulfill to be considered worthy of an Arrow release? The film should either be highly requested by our fans or be something we feel is valuable to be brought to the UK market, and, in addition, the team’s own personal taste is a high factor. Along with this the considerations are the presentation of the film in the UK (available, not, quality DVD or non-anamorphic, picture quality, extras). Secondary considerations are how the film is presented in other countries, whether it has a good master or not, and whether it is properly authored (quality encoding, lossless audio, extras). As regards the material, it should be of high quality, exhibiting good depth, natural grain, stable, uncut, in the correct ratio and so on). Are the same people involved in the Arrow Academy and Arrow Video releases? Yes, it’s all one team but some work on Academy and others work more on Video but as mentioned the team has very eclectic tastes so it’s not much of a split. Who is the most popular movie-maker amongst the Arrow crew? The popular filmmaker in the Arrow collection is certainly Dario Argento as we have releases of many of his films and if we include his work as a producer that’s even more as DEMONS and DEMONS 2 were very successful. Are there any plans to release Kill Baby Kill and Danger: Diabolik (Mario Bava)? We will hopefully release KILL BABY KILL, possibly this year but DANGER: DIABOLIK unfortunately is with Paramount. What titles would you have loved to release that you didn't get the chance to? Suspiria!!!! The David Lynch Collection as released by Universal was another big one, I am a huge Lynch fan and would have loved to have been able to tackle his films, especially ERASERHEAD. Likewise VIDEODROME which we’ve had flat out no’s so many times I should probably let it go and stop annoying everyone at Universal! John Carpenter’s films too which are very unlikely to happen being with other companies who won’t let them go. REPO MAN would have been amazing but the Eureka release is lovely, though I can’t help but still wanting it to be part of the Arrow Video collection. There are probably loads but it’s not worth going on about what could have been. We’re very lucky to have released some really wonderful films, even upcoming some real greats like PHANTOM OF THE PARADISE and WHITE OF THE EYE are my passion projects right now. Do you accept suggestions from people who purchase products from you (and if so how do we make them)? Have you seen an increase in sales this year? Compared to before, you seem to now put a lot more effort into both the restoration/ clean up and encoding side of your discs. I personally value quality of the product over quantity of titles, and thus my Arrow purchases have shot up this year. Indeed, I don't think I bought a single Arrow disc until ZOMBIE FLESH EATERS! Now I have a small collection of 20 titles. We’ve seen an increased number of new customers and for the past 13 months we have been releasing more titles. Things were patchy before, in large part to the volume of Italian titles which weren’t up to the quality of the American or French films we released, depending on your interest you may want to check those out. I can certainly recommend De Palma’s OBSESSION, the anthology Edgar Allan Poe, horror SPIRITS OF THE DEAD by Fellini, Malle and Vadim, Jules Dassin’s seminal crime film RIFIFI, THE TIN DRUM, FRANKENHOOKER, MANIAC COP and others. Now that you're playing on a whole new level, do you plan on going back to any of your older titles which didn't get such loving treatment? You appear to be doing so with TENEBRAE, is there anything else planned? A pleasure. Sort of - we have a sampler DVD coming out soon which will reveal some of our as yet unannounced titles. This should be free and will be available from Fopp stores but we will try and make this as widely available as soon as possible! Thanks again to Arrow Films for allowing our users this opportunity of an interview. You can support them and Rewind by buying their products from Amazon.